Wagons Ho! 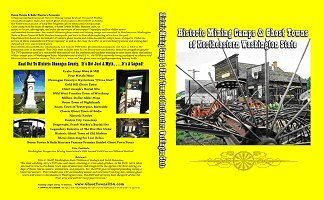 Narrated by Jerry Smith, this colorful forty-five minute DVD slide show presentation transports one back in time to the boom-town days of yesteryear and provides accurate, detailed information on ghost town sites, lost and abandoned gold and silver mines, and other historic sites and points of interest throughout Northeastern Washington. The unique adventure edition of the DVD also highlights treasure hunting adventure destinations chosen by the Boom Towns & Relic Hunters crew and discusses the most popular ways of locating lost relics of Northeastern Washington’s colorful history. A fascinating supplement to the Boom Towns & Relic Hunters of Washington State book, the DVD also stands well on its own and even includes over 211 of Jerry’s rare and historic photographs! The DVD presents itself as a wonderful educational tool for students and teachers who want to learn more about the history of this unique part of Washington State. It is also a “must-see” for ghost town and gold prospecting history buffs. For those planning a trip to the area, this production will provide “advance” information that will add to your appreciation of what you see once you have arrived. Okanogan County's Mysterious "China Wall"
Manufactured in the U.S.A., the DVD is currently being purchased by educational institutions, bookstores, and libraries across the country. "The time watching Jerry's DVD was well spent, resulting in a top-notch product. In his DVD, Jerry takes you back in time to the Boom Town days of yesteryear and brings to life the ageless Old West mining-era days of Boom Towns, miners, prospectors, and pioneers. Yet, the DVD goes far beyond providing simply a historical account. This includes over 211 outstanding photos and locations from long-lost, famous ghost towns and mines in Northeastern Washington State. The DVD will certainly keep the spirit of the Old West alive and well for many years to come." Lost Treasure Magazine, DVD of the month, October 2000. Gold Prospectors Magazine, July 2004. Washington Prospectors Mining Association's 10th Annual Gold Gem and Mineral Festival. To order Jerry’s DVD from Amazon.com, please click on the DVD below. Partners West Book Distributing Inc.